When it comes to holiday entertaining, it doesn’t get any easier than mixed greens and vinaigrette. This base recipe is ultra-simple and pared down to keep the budget low, but you can easily make the dish your own by adding chopped fruits, nuts, raw vegetables, or whatever you have available in your pantry. Substituting three heaping tablespoons of raspberry preserves or orange marmalade for the honey and garlic in this recipe is a simple way to transform the dressing to a fruity vinaigrette. You can use a flavored vinegar to mix things up. This recipe yields just over a cup of salad dressing– twice the portion than you need for a dinner party of eight. The extra dressing will keep well in a jar or bottle in the refrigerator. Just be sure to allow the dressing to come to room temperature before serving, since the olive oil will thicken when it is cold. 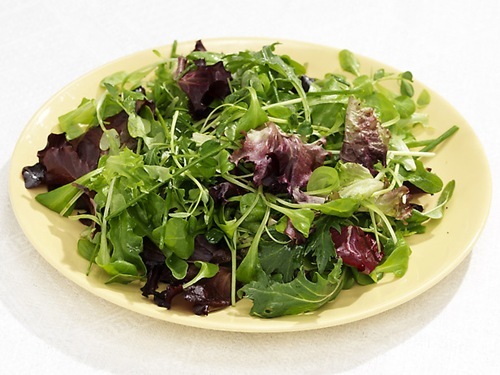 Chop the spinach, lettuce, and arugula into bite sized pieces and place them in a large salad bowl. In a small bowl, whisk together the dressing ingredients. Toss salad with half of the dressing and serve immediately. Store the remaining dressing for another use. Have y’all seen Yummly yet? It’s a database that searches all (or at least most) recipes online. You can sort by a ton of factors, including ingredients, tastes (sweet, salty, etc. ), food allergies, diets, and so on. It’s the best database of its kind that I’ve come across. Check it out if you get a chance – I came up with most of the recipes in today’s meal plan using that site. Portuguese kale-carrot soup–This version calls for soy chorizo, but sub the real thing (the Spanish smoked kind) if you wish. Radish and pine nut salad – An easy, but not boring, salad. Grilled sausage with potatoes and beans – A great grill recipe. Use your yellow beans in place of the green ones. Grilled radicchio – I posted something similar to this recipe last year, but it bears repeating as a reminder to you. This is one of the most awesome ways to prepare radicchio (and romaine and endive, for that matter). Don’t knock grilled lettuce till you try it. Well, hello heirloom tomatoes. So nice to see you again! If you’ve been sweltering in the 90-degree days we’ve been having lately, at least take heart in the fact that the heat is helping local tomato crops. Tangy herbed lettuce soup – I told you last week I’d find you a lettuce soup recipe! This one even uses up some of the potatoes you’ll get this week. Use the green leaf lettuce you get for this recipe, and stick with using the spring mix in salads. Also, use parsley instead of basil (unless you happen to have basil on hand, in which case I’d use both). Tomato-squash skillet – I usually don’t cook heirloom tomatoes because they have such an amazing raw flavor, but if you’re tired of salads and don’t feel like eating them raw this week, try this recipe. I might add a few chickpeas to round out the protein here and make it a vegan main course, or mix in some diced, cooked chicken if you eat meat. Chard-mango smoothie – What? Chard in a smoothie? I know! Sounds weird, but I’m a fan of spinach in smoothies and this isn’t far off. Just give it a shot if you’re skeptical – I think you’ll be surprised at how non-chardy it tastes. I would add about a cup of a liquid to this recipe, maybe some almond milk or orange juice. For the brussels sprouts and green beans, I’m thinking a nice turn on the grill would work for both – I’m loving grilled veggies these days. Grease a grill wok and add the veggies tossed in some olive oil and your favorite seasonings (I’ve been using lemon pepper lately). Grill over medium-high heat until tender, around 10 minutes, stirring often to keep the ones on the bottom from burning. Make sure to trim the green beans or halve the brussels sprouts before cooking. If you don’t have a grill wok, just put the veggies on a big piece of aluminum foil on the grill, or use your broiler instead. Here are some easy recipes that you can serve at any holiday meals you might host this weekend. Garlic scape and almond pesto – This would be good over fish, or pork, even. Strawberry and beet tartare – This sounds so interesting! I’m thinking it makes a good spread for water crackers. Radish tart – A good vegetarian brunch dish. Fettucine with mustard greens and mushrooms – Escarole will work here if that’s what you get. This recipe makes a lot, so you’ll probably have to halve it because you won’t get enough mushrooms for the whole recipe. Kale with caramelized onions and garlic – I like the addition of onions to the traditional sauteed kale. As the lettuce we’re getting is a pretty tender kind (as opposed to tougher varieties like romaine), I’m just going to use it in salads. I’m working on digging up some other ways to use lettuce, but most of the more tender varieties just won’t stand up to cooking.